The beautiful orange pumpkin of autumn in the United States is the Cucurbita pepo (L.). Pumpkins are native to North America, where they have been growing for about 5,000 years. Can you imagine the early settlers surprise when they saw this beautiful orange vegetable and learned that it was edible? As an aside: last weekend I went to my cousin’s home in Pennsylvania and had the best pumpkin pie I ever ate. When I compliment my cousin’s wife, she responded that the recipe was her Grandmothers. Pumpkins remind American’s of traditions, pumpkin pie being one of them. Although pumpkins did not grow in the Holy Lands, pumpkins are in the Cucurbitaceae family of plants which includes gourds and squashes. These two plant types grew in the Holy Lands. From my last post you know that gourds were present in Israel. If you want to grow pumpkins, all you need is pumpkin seeds and space. Pumpkins grow best from seeds. Pumpkin vines can grow up to 20 feet and grow optimally in a field or large space. Recently, I have seen articles on growing plants in containers using a trellis. Because I have not tried this technique, I can’t recommend. It takes about 100 frost-free days for a pumpkin to reach maturity. When I plant pumpkins (or watermelons), I place it on a plant pedestal so that the pumpkin doesn’t flatten out or turn brown from laying on the ground. Pumpkins are native to the United States (my country). I love that pumpkins are uniquely mine (as an American). One definition of unique is “distinct characteristic.” Christians, especially, Christians in the 21st century are unique. Most certainly they should have distinct characteristics the foremost of which is believing that Christ, the son of God, is the Savior of the world. At the same time that I believe in this unique aspect of Christ, I know that many individuals identify themselves as Christians but have not accepted Christ as their Savior. What in the world am I to do about the dichotomy between people naming themselves “Christian;” yet not experience the real presence of Christ in their lives, of not accepting that they are broken and need a Savior? Every Christian (real Christian) has to answer that question for him/herself. I try to live a life that shows forth my love of Jesus and gratitude for what He did for me. I write about Christianity in my books and blogs. Most days, I don’t think I do enough to really thank Christ for being the unique son of God, coming to earth, and providing a way for my salvation for me. Reflection: Does your life show any Christian uniqueness; that is, any distinctive characteristic of being in a personal relationship with Christ? When I received my first Bible, in it was a picture of Christ. He had shoulder-length medium brown hair that was clean and combed, he was beardless, and his complexion was medium. Christ’s expression was serene and thoughtful. Recently on-line, I saw another picture of Christ surrounded by disciples. He was a vigorous, healthy-looking male with neck-length light-brown hair. He was beardless and smiling. In both representative pictures, Christ was attractive. • “As Christ grew and in adulthood, he had no form or majesty that we should look at him, and no beauty that we should desire him” (Isaiah 53:2). • After the Roman soldiers were finished torturing Christ, “many were astonished at you— his appearance was so marred, beyond human semblance, and his form beyond that of the children of mankind” (Isaiah 52:14). 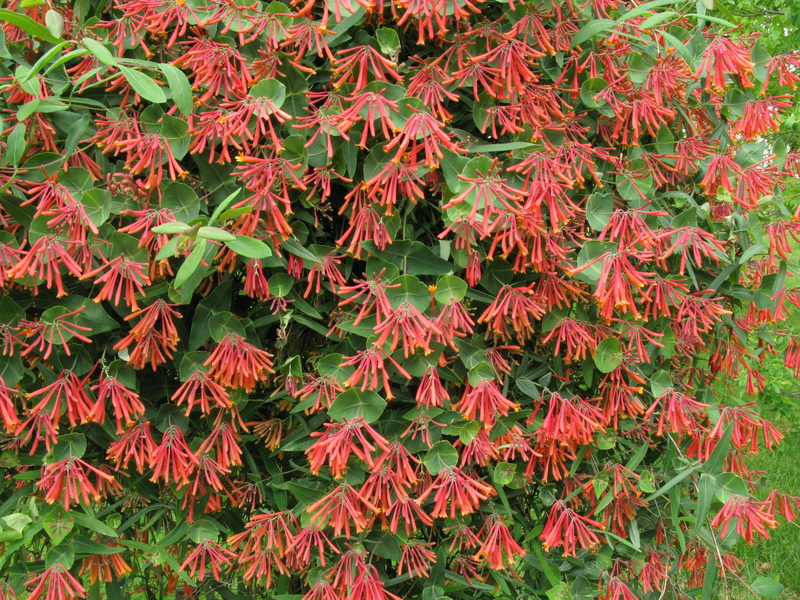 In contrast to the reality of Christ, the coral honeysuckle (Lonicera sempervirens) is described by all as attractive. It is the 2014 Virginia wildflower of the year. The honey suckle is a twining woody vine that often trails over the ground or climbs other vegetation. When cultivated, gardeners often grow this honeysuckle on trellis to display the beauty of the flowers. Coral honeysuckle has evergreen leaves and terminal flower clusters. Flowers are produced from early to mid-spring and sporadically thereafter. The corolla is tubular with five fairly equal sized loves. From the outside coral honeysuckle looks deep pink to red; however, the inside is frequently yellow but can be red or orange. Coral honeysuckle is famous because it attracts butterflies and hummingbirds. Nectar is abundant and has a floral odor. The bright red fruits are attractive to birds such as finches, thrushes and robins. The plant is host to larvae of spring azure butterflies and snowberry clearwing moths. 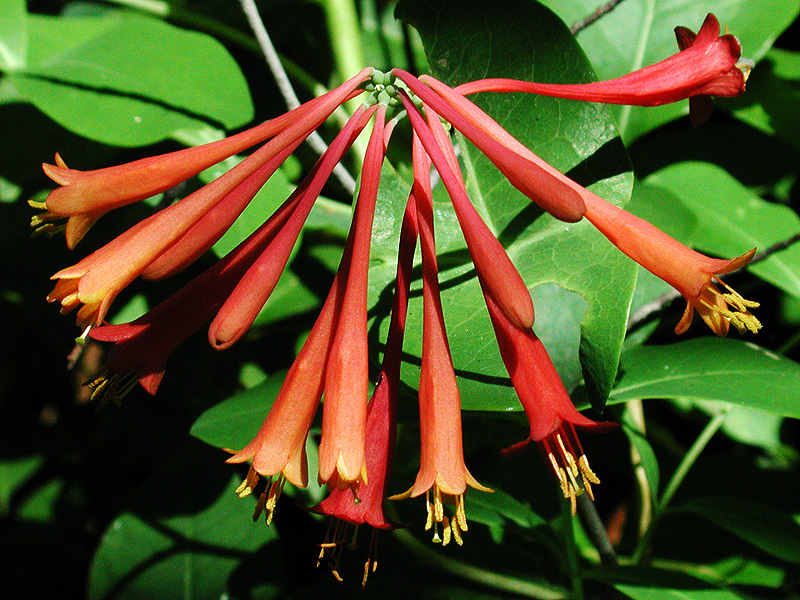 Native Americans believed the coral honeysuckle had healing properties. They used leaves (dried, smoked, or steeped in water) as a tea to treat asthma, sore throats, and coughs. Chewed leaves were applied to bee stings and supposedly alleviated swelling. Native Americans were aware that in humans honeysuckle berries caused nausea and vomiting. When I saw pictures of the coral honeysuckle and read its attraction to birds and insects, I thought about Christ. Only Christ was not necessarily physically attractive. Because he was fully man, by the end of long days, both he and his clothes smelled like perspiration. He was an itinerant rabbi (teacher). Likely, Christ did not have toilet paper, take a daily shower, or use a tooth brush or dental floss. UGH! What attracted people of his time to Christ? In those days, 5,000 -7,000 individuals was a large number of folks to go out and listen to even the greatest teacher; but Christ drew this size crowds. What attracts me to Christ is his message as described in the Bible, but particularly, the gospels. I still cannot comprehend an individual loving me enough to be tortured and die for me. Why would God want to do this? I am indeed a wretched creature and Christ is the Son of God and part of the Trinity. Reflection: Reflect on Christ’s appearance. Compare it to your ideas of attractiveness. Copyright: February 8, 2015, Carolyn A. Roth, all rights reserved. In New International Version Study Bibles (NIV) and in the English Standard Version (ESV) study Bible, Genesis 30:37 reads: “Jacob, however, took fresh cut branches from poplar, almond, and plane trees and made white stripes on them by peeling the bark and exposing the white inner wood of the branches.” In contrast to these Bible translations, the Darby Bible (DBY) recorded the same verse as “And Jacob took fresh rods of white poplar, almond-tree, and maple; and peeled off white stripes in them, uncovering the white which was on the rods.” In Darby’s translation, the plane tree was translated as maple. In present day Israel, only one type of maple tree grows, the Syrian maple (Acer obtusifolium, Acer syriacum). The Syrian maple is considered a Mediterranean tree. In Israel, it is present in woodlands, shrub-lands, and around Mount Herman. Most likely, Jacob would have had access to the Syrian maple tree if he opted to use it as he attempted to control the color of flocks. At the time Jacob was living in an area which today is most likely part of Syria. Looking at the photograph of young Syrian maples, it is easy to see why Jacob could have used the Syrian maple if he wanted spotted flocks. In Latin, the word for maple is “Acer,” which means sharp, irritating, and pungent. Romans used the wood for spear shafts. The Latin word “obtusifolium” is translated as blunt, obtuse, or dull and folium as leaf. Obtusifolium means this maple tree has a blunt leaf. Leaves are green and in pairs on opposite sides of a stem. This tree sheds its leaves during summer months when weather is scorching hot in Israel. Flowers, which appear on the Syrian maple in April, May, and June are greenish cream. Flowers turn into seeds which are startling in their pinkish red color. The more I learn, the more I could get confused about some of the technicalities of the Bible. For example, did Jacob use a maple or a plane tree? The answer is that the Bible was not written as a book for botanists (as much as I would have liked that). Rather, the Bible was written to disclose the Triune God. Studying God is a better use of our time than trying to figure out the exact species of tree used by Bible characters. In the United States, the maple tree is the Acer saccharinum (Silver maple). This beautiful tree can grow to 100 feet tall. It has high wild-life value and is loved by birds, squirrels, fox, and other small mammals. In springtime, flowers appear before leaves and are a welcome harbinger of warmer days. Reflection: When you read the Bible do you get bogged down in details such as the one in this blog, or are you able to concentrate on God and his Son’s redemptive work on the cross? Copyright September 26, 2017; all rights reserved. The Teacher compares the meaning of life to a burning thorn under a pot in Ecclesiastes 7:6. Bible scholars are not sure who wrote Ecclesiastes. Possibly it was written by Solomon, one of his offspring who reigned later in Israel’s history, or a learned teacher in the Israelite assembly. Within Ecclesiastes, the writer refers to himself as Teacher. One proverb that the Teacher wrote was, “Like the crackling of thorns under the pot, so is the laughter of fools. This too is meaningless” (Ecclesiastes 7:6, NIV-SB, 2002). In ancient Israel, cooking fires were located in outer courtyards or inside homes. The time of year influenced where the fire was located. In hot weather it could be found in the courtyard. While in cooler or cold weather, the fire was probably located inside the home to add warmth. Many poorer Israelites cooked over a simple hole in the ground (a fire pit) with rocks around it. Others had ovens, either inside the home or in the courtyard. When King Jehoiakim sat in his winter house with a fire burning in the firepot (Jeremiah 36:22), the firepot was probably a three-legged hearth of copper or bronze. Wood was the primary fuel used for cooking in ancient Israel; however, in Ecclesiastes 7:6 thorns fueled the fire. Thorn bushes burn faster than dense wood. Many times when thorns were collected and burned, green branches were present at the base of the thorn plant even when the bush appeared dry. Burning green branches contributed to the crackling sound when thorns were burnt. Thorns as the fuel made the point of the Teacher’s proverb. The laughter of fools is like a short-lived fire fueled by thorns not wood. A fool’s laughter, although perhaps loud, does not last very long. It is valueless or meaningless. 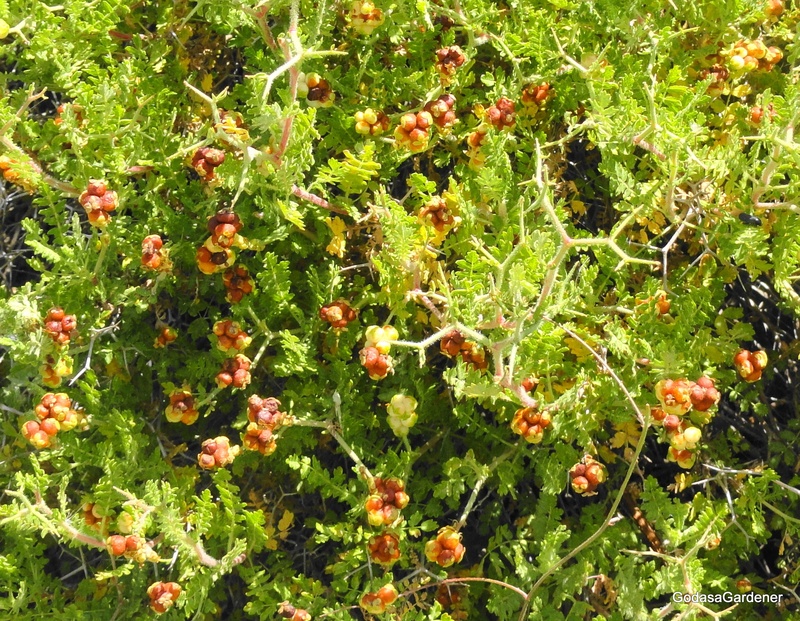 The thorn plant of Ecclesiastes is the Sarcopoterium spinosum. Other names are the thorny burnet and prickly burnet. The thorny burnet’s origins are prehistoric, but it may be native to the Middle East. In present-day Israel, the plant is wide spread in Israel from Mount Hermon and Galilee in the north to the Negev hills and Eilat in the South including the Mediterranean coast. The thorn burnet is a dwarf, perennial shrub that resembles a ball or pillow. In the female flower, two or three ovaries are set in 4-5 joined sepals. The top of the corolla is covered by the tips of the sepals which make the female flower resemble a covered pot. These flower pots are numerous on stems. When the female flower is young, it is green, but turns reddish at maturity and rusty brown as it dries. In the heat of fire, the flower “pots” pop and produce a small explosive sound which sounds like crackling. The thorny burnet is used to make brooms, to stuff mattresses, and to form low-growing hedges. In the Bible, thorny plants were often associated with desolation and ruin. In the Teacher’s parable in Ecclesiastes 7:6, the meaning was futility. Although a thorny burnet fire may snap, crackle and pop, and be pleasing to the ears, the sound adds nothing to the heat. Futility implies an action that has no use or purpose. Synonyms are ineffective, pointless, and vainness and the antonym is useful. Malachi is one of the few, if only, prophet in the Old Testament who wrote about futility. He related a hypothetical conversation between God and men of Israel (Malachi 3:13-18). One group identified that it was futile to serve God and carry out his requirements. Arrogant, evildoers prospered. The redemption (Messiah) that good men looked for had not appeared even after many centuries. Another group of men feared and followed God. God wrote this group’s names in a scroll of remembrance, similar to a record of notable deeds kept by earthly kings (Esther 6:1-6; Isaiah 4:3). God promised that in the day he makes up his treasured possessions, the men’s names in the scroll would be spared. Malachi’s point is that fearing and serving God are not futile but have long-term rewards. Paul identified several ways and situations where man’s thoughts were futile, e.g., useless and ineffective (Romans 1:18-23, 8:20; 1 Corinthians 3:20-21, 15:17; Ephesians 4:17). Two points seem particularly important today. First, God is revealed though his creation, yet unrighteous men neither glorify God nor give him thanks (Romans 1:18-23). Instead their thinking becomes futile and their foolish hearts are darkened. They exchanged worship of the immortal God for worship of man-made images, e.g., birds, animals and reptiles. Today, most men and women do not worship animals, but, sometimes, they let their admiration for another man or women approach worship of them. They hang onto the words of these men/women rather than focusing on God’s instruction for life. Reading commentaries of the Bible should never take the place of reading God’s word. Writing to the Corinthian church, Paul stated that “if Christ has not been raised, your faith is futile; you are still in your sin” (1 Corinthians 15:17, NIV-SB, 2002). Redemption of our bodies, eternal life in Christ, depends on a risen Christ. When I was in college, The Passover Plot (Schoenfield, 1995) was required reading for anyone trying to be intellectual. The book argued that Christ implemented an elaborate plan to have himself declared the Messiah. He never died on the cross but was hidden away by his closest associates. He appeared three days later to fulfill the Jew’s expectations for the Messiah. The problem with The Passover Plot’s argument is the lived experiences of individuals who saw Christ’s death and his resurrected body. Evidence of Christ’s death comes from eye-witness accounts of non-believers as well as believers (Mark 15:39; Luke 23:46-49). In his resurrected body, Christ appeared at least 11 times to over 500 people. The phenomena of Christ’s death and resurrection may confound the wise; but do not make the phenomena any less real. Reflection. The Lord knows that the thoughts of the (supposed) wise are futile (1 Corinthians 3:20). We cannot believe everything we read in books. Truth is not a prerequisite for publication.